LG Electronics on Monday announced its surprise entry into the growing home beauty market by launching four skin care devices. By combining the company’s hardware manufacturing capabilities and the cosmetics business of affiliated LG Household & Healthcare, the tech titan said it aims to expand into the beauty device market. 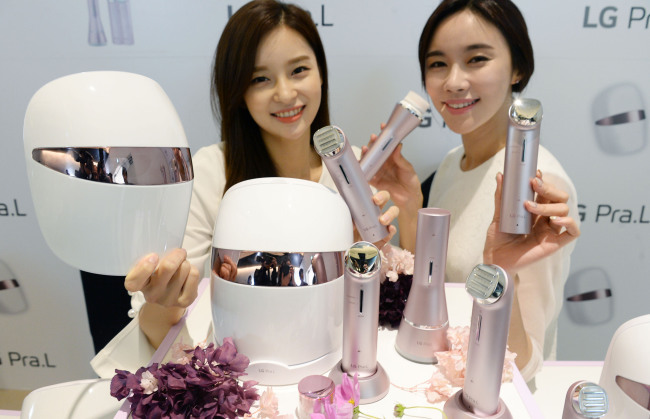 Branded as Pra.L, LG’s home beauty appliance lineup consists of the Derma LED Mask, the Total Lift-up Care, the Galvanic Ion Booster and the Dual-Motion Cleanser. The Derma LED Mask has 120 light-emitting diode lights that penetrate into different levels of the skin to improve the tone and tightness. The mask device is recommended particularly for the forehead, lips and eyes. The Total Lift-up Care enables skin tightening by using high-frequency LEDs and micro-currents. The Galvanic Ion Booster helps cosmetics penetrate deeper into the skin, while the Dual-Motion Cleanser is capable of making skin 10 times cleaner than conventional methods. According to LG, the domestic market for household beauty appliances is estimated at 450 billion won ($396 million), growing around 10 percent annually. The official hinted that the electronics maker will seek cooperation not only with its cosmetics affiliate but also with foreign cosmetics makers such as L‘Oreal in the near term.